The application of medical ultrasound was mainly centered on the soft tissue diagnostic imaging until now. Recently, its use has been widened and adopted for various therapeutic purposes. It has been reported to facilitate the healing of bone fractures, wounds, apthous ulcers and temporomandibular disorders. In addition, ultrasound has also been shown to facilitate delivery of chemotherapeutic drugs into tumors, promote gene therapy to targeted tissues, and deliver thrombolytic drugs into blood clots. This article reviews the principles and current status of ultrasound-based treatments. Diabetes mellitus is a group of metabolic disorders characterized by abnormal secretion and metabolic action of insulin. Hyperglycemia, the key feature of this endocrine disorder causes multisystem damage leading to untoward effects in various tissues collectively referred to as "Diabetic complications". Diabetes alters the oral health to a great extent. Indeed, periodontitis has been reported as the sixth complication of this disease. This article gives an overview of the oral effects of diabetes with an emphasis on periodontal disease and its relationship with cardiovascular disorders and pre-term birth. Dental considerations for management of these patients and recent advances in the dental field with respect to diabetes are also highlighted. Recent exciting new discoveries place dental professionals at the forefront of helping their patients benefit from potentially life-saving therapies derived from a patient's own stem cells obtained from deciduous or permanent teeth. 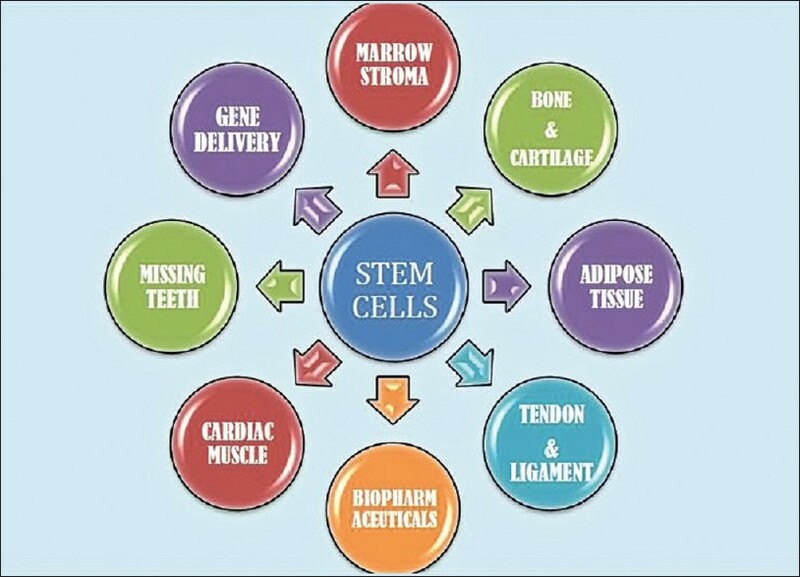 The great hope is that suitable stem cells, produced in large quantities through cell culture methods and injected into failing tissues and organs, will produce fresh, replacement cells to take over from lost or damaged ones. This ability to grow and regenerate tissues is the focus of the emerging field of ­personalized medicine which uses a patient's own stem cells for biologically compatible therapies and individually tailored treatments. This review focuses on the role of oral physicians in the recovery and use of the stem cell in both dental and medical regenerative therapies. Systemic chemotherapy is increasingly being used with radiotherapy for the radical treatment of advanced head and neck cancers. Chemotherapy offers modest benefits in the metastatic setting. Platinum containing agents are the most active drugs and form the mainstay of most chemotherapy schedules. In recent years taxanes have shown activity in head and neck cancers and are being ­incorporated into neo-adjuvant and concomitant chemotherapy regimens. Targeted agents and epidermal growth factor receptor (EGFR) inhibitors, like cetuximab, in particular, have shown benefit in the metastatic and the concomitant setting. EGFR inhibitors and other targeted agents form the thrust of pre-clinical and clinical research into the systemic treatment of head and neck cancers. Lectins comprise a stracturally vary diverse class of proteins charecterized by their ability to selectively bind carbohydrate moieties of the glycoproteins of the cell surface. Lectins may be derived from plants, microbial or animal sources and may be soluble or membrane bound. Lectins is a tetramer made up of four nearly identical subunits. In human, lectins have been reported to cause food poisoning, hemolytic anemia, jaundice, digestive distress, protein and carbohydrate malabsorption and type I allergies. The present review focuses on the classification, structures, biological significance and application of lectins. Background and Objectives: A major objective in endodontic therapy is to disinfect the root canal system prior to obturation. This is because the residual root canal infection can sustain persistent or recurrent periapical disease. Hence, the use of an intracanal medicament between appointments helps in the elimination of bacteria that remain even after cleaning and shaping. 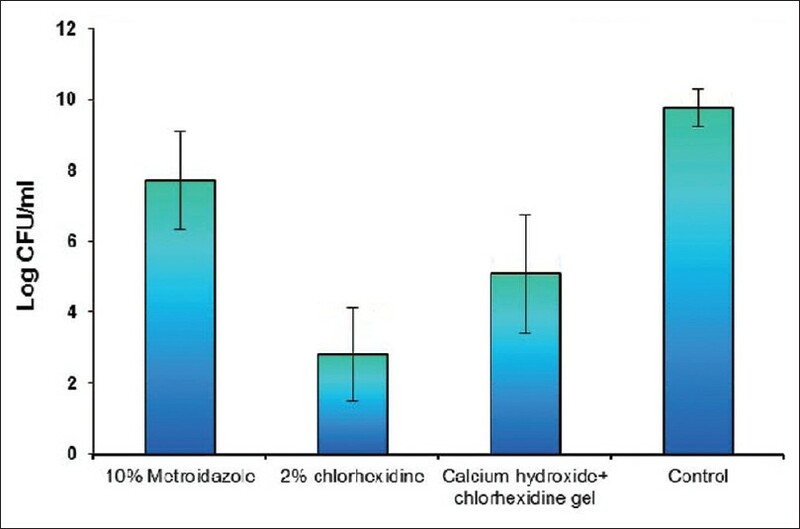 The objective of this in vitro study is to compare the antibacterial efficacy of 10% metronidazole gel, 2% chlorhexidine (CHX) gel, and a combination of calcium hydroxide and 2% CHX gel against Enterococcus faecalis (E. faecalis) using a culture technique. Materials and Methods: The study included 40 single-rooted, human permanent teeth, ­extracted for periodontal or other reasons. Conventional access to the root canals was obtained using access preparation burs in a high speed handpiece. The working length was determined using the Ingle's radiographic method and the canals were instrumented using a Step-back technique with K-files, up to size 40, at the apex and irrigated with 1 ml of 2.5% Sodium hypochlorite and Ethylenediaminetetraacetic acid gel. The root canals were filled with a sterile Casein Soya meal peptone solution (CSL) and autoclaved twice for 30 minutes at 121°C. An inoculum of E. faecalis was injected into the canals using a sterile syringe and it was incubated aerobically at 37°C for nine days. The specimens were then randomly divided into three experimental groups (10% metronidazole gel, 2% CHX gel, and a combination of calcium hydroxide and 2% CHX gel) and one control group, each containing 10 samples. Following this, the canals were cleaned using an ultrasonically activated No.15 K-file, along with sodium ­hypochlorite irrigation. After medicament removal, each root canal was prepared manually with a new size 40 hedstrom file. The colony forming units per millimeter were determined by the standard laboratory methods. The obtained data was subjected to statistical analysis using the Mann-Whitney test and the χ2 test. Results: In our study, Group II (2% CHX gel) showed significant reduction of E. faecalis. Group I (10% metronidazole gel) showed minimal ­reduction, and Group III (2% CHX gel with calcium hydroxide) showed moderate ­reduction. There was no ­reduction in observed in Group IV (control group) patients. Conclusion: Our study ­signifies that 2% CHX gel showed substantial antimicrobial activity against E. faecalis. The ­combination of calcium hydroxide and 2% CHX gel also showed good ­antimicrobial activity. Hence, the efficacy of 2% CHX gel was greater than its ­combination with ­calcium hydroxide. The least effective drug against the microbes was metronidazole. 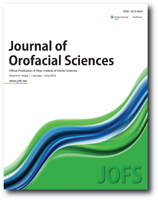 Background and Objective: The success of a removable denture is measured by its retention and stability which rely on the structural integrity exhibited by the underlying residual ridge. However the residual ridge undergoes a progressive resorption, causing a reduction in its size. The multifactorial etiology of the reduction of residual ridges makes it significant for the operator to try and understand as well as to predict the rate of resorption prior to fabrication of dentures. The objective of the study was to evaluate a simple, fast and cost effective diagnostic tool to study and anticipate ridge resorption. Materials and Methods: 17 completely edentulous male patients were selected for the study. Standardized orthopantomographs were made for all the subjects and measurements were made on them. The resorption index was calculated for each patient. A random urine sample was taken from each patient to investigate the 24 hours urinary calcium-creatnine ratio. Results: A direct relation was seen between patients with lower resorption index and lower 24 hours urinary calcium-creatnine ratio. Clinically these cases had undergone a marked amount of reduction in the residual alveolar ridges with respect to the width and height. Also, a direct relation was seen when the patients presented with higher 24 hours urinary calcium-creatnine ratio and greater resorption index. 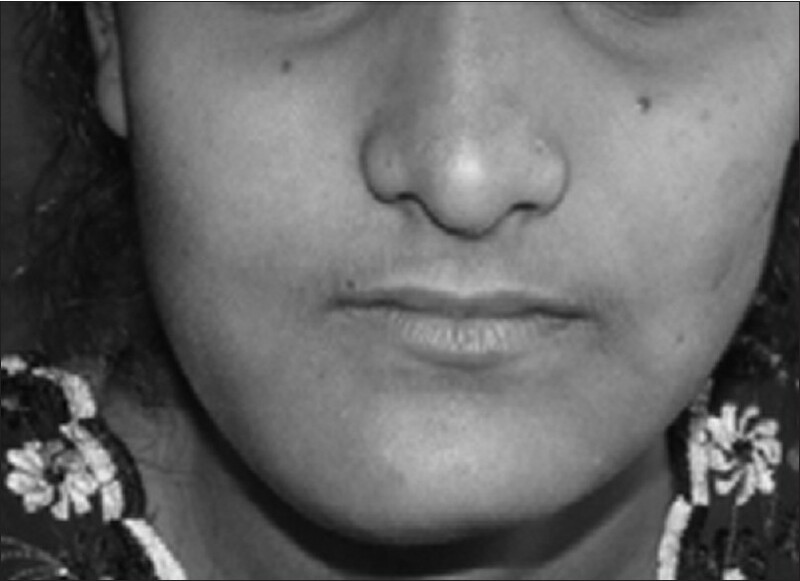 These patients presented with good height and width of the residual ridges. Conclusion: Our study shows a direct relation between the resorption of the bone and the calcium-creatinine levels of the edentulous subjects. The calcium-creatnine ratio in conjunction with the resorption index can be used as a simple and cost effective diagnostic tool. Aims: Liquid dish washing solution (DWS) was used as a substitute for xylene to dewax tissue sections during hematoxylin and eosin (H and E) staining. The aim was to test and compare the hypothesis that xylene-ethanol free (XEF) sections deparaffinized with diluted DWS are better than or at par with the conventional H and E sections. Materials and Methods: Fifty paraffin-embedded tissue blocks was included. One section was stained with conventional HandE (group A) and the other with XEF HandE (group B) staining method. Slides were scored for parameters: nuclear, cytoplasmic, clarity, uniformity, and crispness of staining. Z test was used for statistical analysis. For accuracy of diagnosis, sensitivity, specificity, positive predictive value, and negative predictive value were tested. 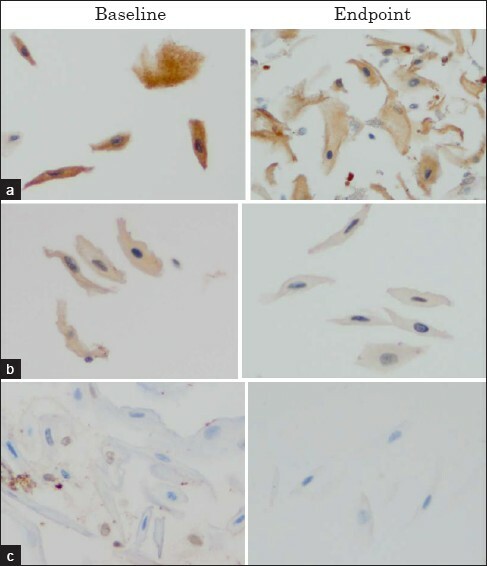 Results: Adequate nuclear staining was noted in 94% in group A and 96% in group B, ­adequate cytoplasmic staining in 92% in group A and 86% in group B, clarity in 94% of group A and 96% of group B sections, uniform staining in 92% of group A and 80% of group B sections, crisp stain in 96% of group A and 88% of group B sections, and 94% of group A sections stained adequately for diagnosis as compared with 90% in group B sections. Conclusion: Liquid DWS can be used as an alternative and effective substitute to xylene and ethanol in routine HandE staining procedure. Objective: A preliminary study was conducted to investigate the feasibility of using an oral cancer chemopreventive agent (−)-epigallocatechin-3-gallate (EGCG), the most biologically active component in the green tea extract, in a form of "swish-and-spit" mouthwash. Such application of EGCG is beneficial as it maximizes exposure of the oral mucosa to the agent but minimizes systemic side effect. 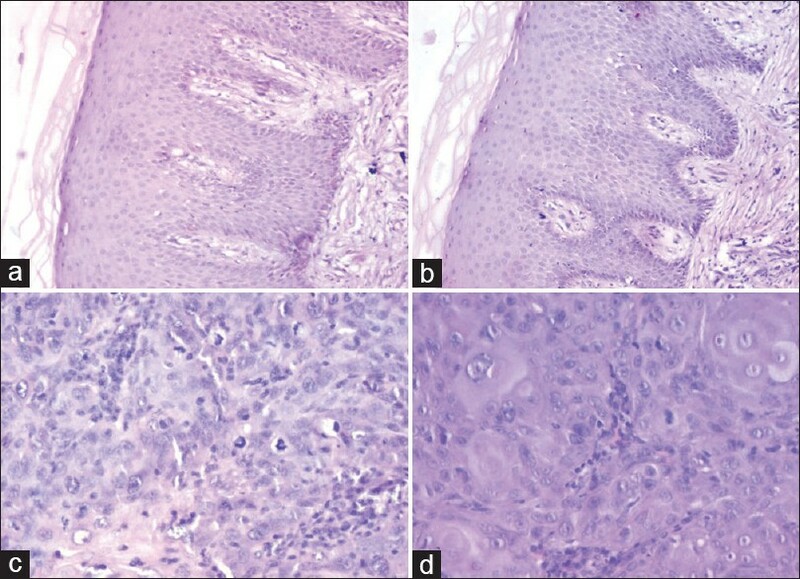 Materials and Methods: The study was conducted on individuals suspected to have oral field cancerization who are at a high risk for developing recurrent oral precancerous and carcinomatous lesions. EGCG was used as a daily mouthwash for 7 days. EGCG's ability to modulate target molecules implicated in oral carcinogenesis was assessed by measuring the change in the expression levels of biomarkers. Results: Immunohistochemical expressions of phosphoactivated epidermal growth factor receptor (pEGFR), cyclooxygenase-2 (cox-2), and ki-67 were evaluated at baseline and at the endpoint (day 8). Although not statistically significant, overall decrease in expression levels of pEGFR (27.5%), cox-2 (15.9%), and ki-67 positive cells (51.8%) was observed following EGCG treatment. Moreover, a detectable level of EGCG was found in saliva but not in plasma after the 1-week treatment regime, demonstrating local availability of EGCG in oral mucosa without significant systemic absorption. Conclusion: To the best of our knowledge, this is the first study to explore use of oral cancer chemopreventive agent in the form of mouthwash in patients with oral field cancerization. Although a definitive conclusion was not reached due to limited sample size, if proven effective, EGCG therapy may offer a non-invasive preventive modality for oral field cancerization. The aneurysmal bone cyst is an uncommon lesion which has been found in most bones of the skeleton, although the majority occur in the long bones and in the spine. It was first described as a distinct clinical entity by Jaffe and Lichenstein in 1942 to describe the ­characteristic "blow-out" of the bone seen in the radiographs of the lesion. In the past, the lesion has been classified as an atypical giant cell tumor or benign bone cyst. We report a case of an aneurysmal bone cyst in an 18-year-old patient who reported with the chief complaint of swelling on the right side of the face since 4 months. It was non-tender, non-fluctuant, and hard in consistency. Radiographic examination revealed a large, expansile, multilocular lesion suggestive of benign odontogenic tumor. Complete enucleation was carried out and the final histopathologic diagnosis of aneurysmal bone cyst was given. In endodontics, several anatomic variations occur in teeth, both externally and in the internal root morphology, which play a very significant role in the diagnosis and treatment outcome. A thorough knowledge of the root canal anatomy, careful interpretation of the angled radiographs, proper endodontic access cavity preparation, and exploration of the root canal are the prerequisites for endodontic success. In a maxillary first premolar, it is rare to find extra roots and canals, and the aim of the present article is to report a case about the successful diagnosis and clinical management of bilateral three-rooted maxillary first premolars, with three independent root canals. An ocular prosthesis is a simulation of of a perfectly normal healthy eye and surrounding tissues. The primary purpose of an ocular prosthesis is to maintain the volume of eye socket and create the illusion of a healthy eye and surrounding tissue. A custom ocular prosthesis is a good option when reconstruction by plastic surgery or the use of Osseo-integrated implants is not possible or not desired. 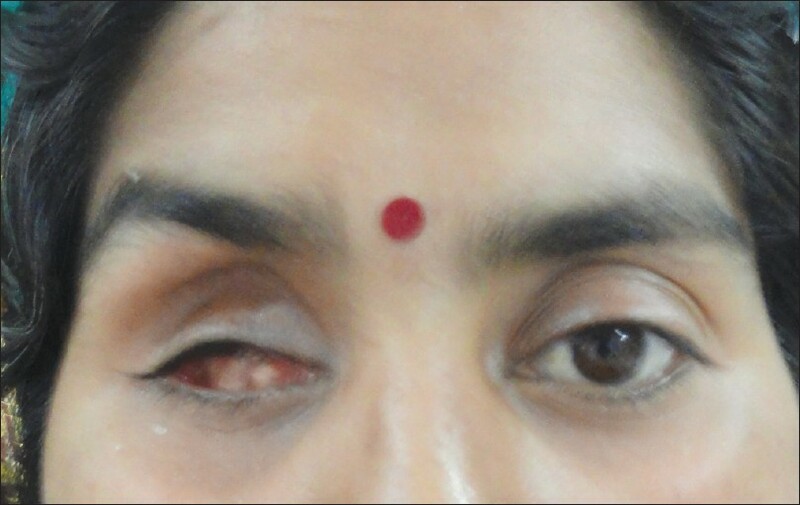 Prosthetic rehabilitation of a patient with missing eye with custom made ocular prosthesis was described. Advantages include improved adaptation, increased mobility of prosthesis, improved facial contours and enhanced esthetics gained from the control of the iris and sclera. An accurate alignment of the artificial eye is one of the major prerequisites for esthetic success of the ocular prosthesis. According to Sir William Osler, Mouth is the mirror of the body which reflects systemic ­diseases. The oral mucosa may be affected by a variety of mucocutaneous diseases and oral lesions may occur first or very early in several mucocutaneous disorders. The erosive gingival lesions associated with vesiculobullous diseases such as lichen planus, cicatricial pemphigoid, and pemphigus vulgaris have been collectively referred to as "Desquamative gingivitis" (DG). Gingival desquamation is a clinical sign in which the gingiva appears reddish, painful, glazed and friable with destruction of the epithelium. This gingival desquamation is due to various disease processes in gingiva. The disease process may be a localized disease of gingiva or a systemic disease which manifests in the gingiva. It is important to be aware of this rare clinical entity so as to distinguish DG from plaque induced gingivitis which is an extremely common condition, easily recognized and treated daily by the dental surgeon. Accurate diagnosis and effective treatment of these lesions may greatly diminish or reverse disease progression. Here by, we present a case of mucous membrane pemphigoid presenting as gingival desquamation in a 45 year old female. Our patient presented with generalized erythematous gingiva and gingival desquamation involving the free, attached and marginal gingiva of left maxillary and mandibular dentition. However, other mucosal and skin involvement was not appreciated in the present case. Thorough history, clinical examination, histopathology and immunofluorescence studies helped us to arrive at the diagnosis of this rare sub-epithelial blistering disorder. Sturge-Weber syndrome (SWS), sometimes referred to as encephalotrigeminal angiomatosis, is a rare congenital neurological and skin disorder. It is one of the phakomatoses which is often associated with port-wine stains of the face, glaucoma, seizures, mental retardation, and ipsilateral leptomeningeal angioma. It is characterized by proliferation of arteries of the brain, resulting in multiple angiomas that occur on the same side due to arteriovenous malformations. Normally, only one side of the head is affected and mainly results from the errors in both the mesodermal and ectodermal development. 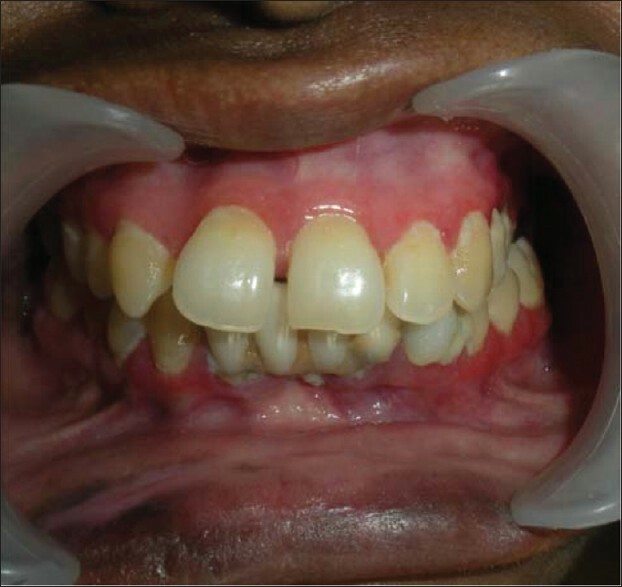 Here, we report a rare case of SWS having oral and facial manifestations, where an 8-year-old boy had actually come for treatment of swollen gums, and on examination, we found that he had typical signs and symptoms of this rare developmental anomaly. The main purpose of this publication is to make the clinician aware of the oral manifestations that are seen in the patients with SWS and also to lay stress on the importance of radiographs in the diagnosis of this syndrome. Marginal tissue recession exposes the anatomic root on the teeth, which gives rise to ­common patient complaints. It is associated with sensitivity, tissue irritation, cervical abrasions, and esthetic concerns. Various types of soft tissue grafts may be performed when recession is deep and marginal tissue health cannot be maintained. Double papilla flap is an alternative technique to cover isolated recessions and correct gingival defects in areas of insufficient attached gingiva, not suitable for a lateral sliding flap. 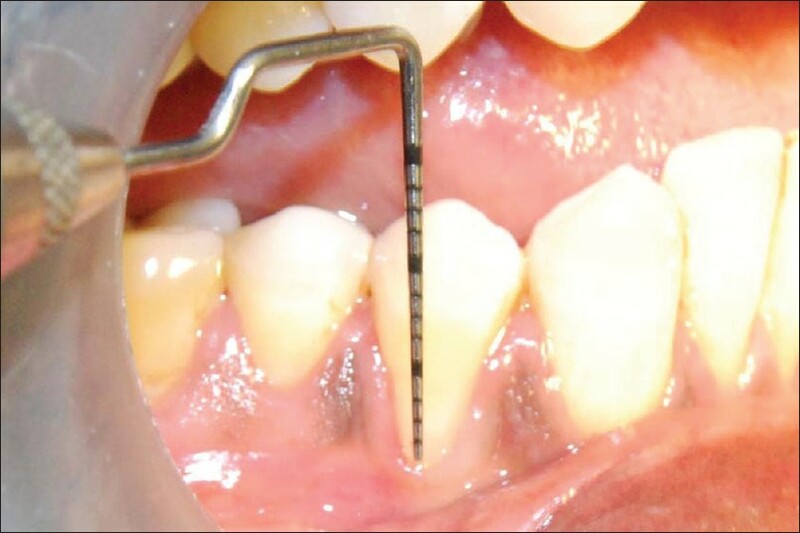 This technique offers the advantages of dual blood supply and denudation of interdental bone only, which is less susceptible to permanent damage after surgical exposure. It also offers the advantage of quicker healing in the donor site and reduces the risk of facial bone height loss. This case report presents the advantages of double papilla flap in enhancing esthetic and functional outcome of the patient.